Futures are staging a fierce comeback on Monday, following a week that was the worst for the Dow in a month. Near 7:20 a.m. ET, Dow futures were up 219 points (1.25%), S&P 500 futures were up 28 points (1.37%) and Nasdaq futures were up 59 points (1.36%). Stocks are just one of several ‘risk’ asset classes surging this morning. 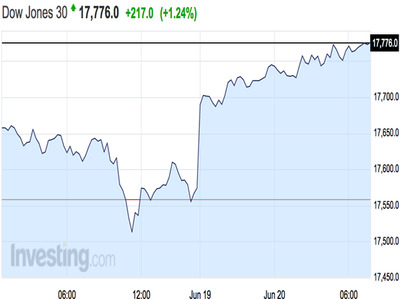 Major European and Asian indexes were sharply higher as well. West Texas Intermediate crude oil futures in New York rose 1.7% to $49.39 per barrel. Dave Lutz, head of ETFs at JonesTrading, said in his morning “trader chat” that sentiment is being helped by three of six opinion polls in the UK published over the weekend, which showed a shift towards “remain” in the referendum vote on Thursday. Treasurys are bearing the brunt of this shift in sentiment. They fell, with the yield on the 10-year note up five basis points to 1.671%. Gold fell 0.89%, or $11.55 an ounce, to $1,283.25. There’s no economic data due today. On Tuesday, Fed chair Janet Yellen will testify on monetary policy before the Senate Committee on Banking, Housing and Urban Affairs.